Where the reinforcement in a section is congested, mechanical couplers may be used to good effect. There are two distinct types of mechanical couplers (see CIRIA 92 Reinforcement connector and anchorage methods):- tension couplers - compression couplersUnless specified otherwise tension couplers should be used. It should be noted that the cover provided for couplers should be that specified for the reinforcement. The notation used on the drawings and schedules for any special end preparation requirements is given as �E� just before the mark. Couplers are mainly tested in tension, but as required, may be tested under compression, cyclic and fatigue regimes. In the UK couplers should be supplied by a company holding a valid third party technical approval (e.g. CARES UK, BBA etc) and should be processed by fabricators being a member of the CARES UK third party certification scheme or equivalent. Several types of coupler are available for tensile and compressive bars. Below is typical examples of commonly available couplers. Lap joint in tension including a fourth bar### Type 1: Couplers with parallel threadsThreads can be cut, rolled or forged. There are two variations to this type of coupler. Type 1a uses reinforcing bars with the threaded portion having a smaller diameter than the rest. Type 1b uses bars with the threaded portion having a cross sectional area equal or greater than the nominal size. The former is rarely used since the load capacity is reduced; the latter which maintains the parent bar load capacity is widely used. An alternative to Type 1 also includes a variant where one end of a parallel threaded coupler is swaged on to a bar. The parallel (Type 1) couplers also have transitional and positional variants. The transitional coupler allows two bars of different size to be joined. The positional coupler usually comprises two halves joined by a parallel thread and lock nut arrangement. This system consists of an internally threaded metal coupler with a tapered thread, and matching tapered bars. Due to its ability to meet the majority of the structural building applications it is popular. The standard tapered coupler can only be used in situations where the continuing bars can be rotated. This is not always practical and more sophisticated tapered couplers have been developed which allow the joining of bars that can not be rotated, and the joining of bars where the continuing bar can neither be rotated nor moved (e.g. L-bars). below some examples of positional and transitional couplers. Type 3: Couplers with integral threads over full length bar High yield reinforcing bars are specially manufactured with helical deformations along the full length of the bar. The deformations form a continuous coarse thread onto which an internally threaded coupler can be screwed. Locknuts are used at either end of the coupler to prevent slippage on the coarse threads. A turnbuckle system for when the continuing bar cannot be rotated is not available, but the coupler can be completely threaded onto one bar and then run back onto the continuing bar to form the joint. A seamless malleable steel sleeve is slipped over the abutting ends of two reinforcing bars. The sleeve is then swaged (deformed) onto the ends of the bars using a hydraulic press. This action effectively splices the bars together. The process can be carried out wholly in-situ. The hydraulic press compresses the sleeve laterally onto the bars and several �bites� are usually necessary to cover the whole joint. Sufficient working space must be available around the bars to enable the hydraulic press to swage onto the bars. In addition, swaging equipment for large diameter bars (H40 and greater) may require mechanical support for safe operation. It is therefore important to take this into account in likely construction sequencing and detailing reinforcement in confined areas. 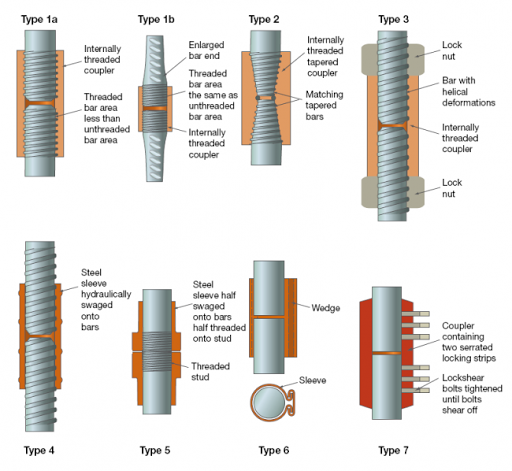 Example of swaged coupler### Type 5: Threaded couplers swaged onto the ends of reinforcing barsIn this system two malleable sleeves which are threaded internally for half their length are joined together by a high tensile threaded stud. The unthreaded parts of the sleeves are hydraulically swaged on the two ends of the bar to be joined. These ends can be screwed together using the threaded stud. The swaging process can be performed by the fabricator prior to arrival on site, in a stockyard at the site, or in-situ. For the latter method it must be ensured that there is sufficient working space around the bars. Connection of the bars with the threaded stud is performed in-situ. This system can be used for connecting compression bars only. The bars to be joined together are held in concentric bearing by the lateral clamping action of a sleeve and wedge. The sleeve is cylindrical in shape, with a wedge-shaped opening. This opening has collared-shaped flanges, onto which a wedge-shaped piece of metal is driven. This action compresses the sleeve laterally and so clamps the bars together. It is very important that the bar faces are cut accurately and aligned to within a 3° maximum angle tolerance. This type of coupler system has been available in the UK since 1986 and is now widely used. The system does not require rebar threading and consists of a steel coupler with a line of �lockshear� bolts running along its length. The two bars to be joined are placed inside the coupler on two hardened serrated steel locking strips, �saddles�, using ratchet wrench or electric or air powered nut runner, which forces the bars against the longitudinal saddles. As this happens, the serrated saddles bite into the bar and wall of the coupler. When the predetermined tightening torque for the bolts is reached, the bolt heads shear off leaving the installed bolt proud of the coupler. This provides a visual check of correct installation. This coupler has proved useful in refurbishment work, joining pile cage steel to pile caps and where couplers are required with minimum lead time. They are, however, relatively bulky couplers requiring space for sockets to tighten bolts. This should therefore be taken into account in considering concrete placement. Often reduced aggregated concrete is required in congested areas.